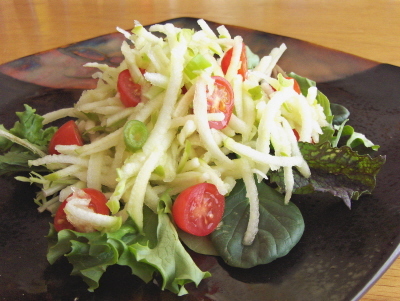 Toss the grated apple with 2 Tbsp. lime juice in a large bowl to keep from browning. Stir in green onions. Nutritional info (courtesy of the magazine): Per serving: 61 calories; 1 g. protein; less than 1 g. total fat (yippee!) and 0 g. saturated fat; 16 g. carbs; 0 mg. cholesterol; 64 mg. sodium; 2 g. fiber; 11 g. sugars. Love the sound of the new blog event – will have to check it out. And I share that sadness of knowing I am unlikely to repeat recipes – although I live in hope! After all, how can you blog about a novel, interesting dish every few days if you eat the selfsame foods day after day? I could not agree more. Blogging really does force you to diversify and be creative it’s why I love it so much! Yet another great blogging event taking place – I love your entry! Delicious!! Looks like it would go with so many things! And yes, so true–we have to keep on trying new things. It’s a nice motivation, isn’t it? I feel like I have learned *not to mention tasted* so much! It looks wonderful – so pretty too. I’m gonna check out that blogging event you mentioned. 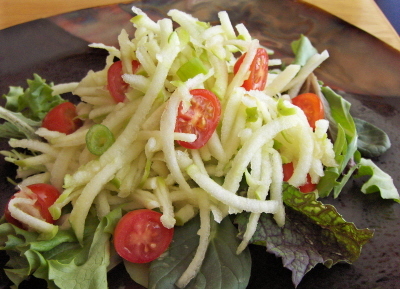 I’ve always wanted to make my own “green papaya” salad. But I’ve never come across the right type of papaya at the my WF. All ingredients are so easy to obtain. And so much easier to find than Green Papaya. Actually, I don’t mind that I never cook the same thing twice…kinda like it actually. Must see if I can find a copy of Veg Times. I think I do actually prefer the apple–great crunch and juiciness. You should definitely check out the blog event–they are always fun. It’s true, I’d never have tried out many of these recipes otherwise. And I keep finding more inspiration in other blogs, so the cycle continues. . . 😉 ! Thanks! It tasted really fresh and crisp. And wouldn’t it be great if we all took part in the event and made each other’s recipes?? One of the reasons I chose this recipe was precisely because I had all the ingredients, they’re easy to get, and it was simple–definitely worth it! Thanks for your comment, and for visiting the blog! And I love the irony (even more so since it was T.B.!). Yes, variety and new recipes is a benefit I hadn’t really thought about before I started blogging. As to daily posts, well, it’s not that I make it my goal to post every day–it just seems to work out that way a lot of the time! Yep, easier is usually better in my kitchen. I love the variety and novelty of making new things. . .but I would also still enjoy revisiting some of my favorites! That salad looks beautiful! I’ve been wanting to try papaya (for my weekly challenge). You’re an expert chef– do you think the recipe would yield good results with real papaya? Oh this looks just so springy-pretty! What a beautiful salad, highlighted by a beautiful photo to boot! Don’t take my word for it (“expert”?? ), but I’d think only green papaya would work well here–and I’ve always had trouble finding it. But do try a regular, ripe papaya anyway–they are yummy! It did make me think of spring–yippee! Thanks so much. Thanks for your comment, and for visiting! Glad you like the look of it (and it tasted pretty good, too). Thanks so much for your response. I’m going to Whole Foods this weekend; hopefully (*crosses fingers*) I’ll be able to find a green papaya. If not, maybe I’ll just have to make those apple-quinoa muffins of yours that have been on my to-try list for some time now. Yes you ARE an expert ;o). Darn, I was *so* hoping you would quote the erudite Paris Hilton in your comment to me.